Anyways friends- let me cut to the chase here: I need to tell you about two incredible books. One is called "7" by Jen Hatmaker, the other is called "the Life-Changing Magic of Tidying Up" by Marie Kondo. My husband gave both of these to me at Christmas (he knows me so well), since I've recently been on this quest to simplify my life in order to have more time for what really matters and to bring Jesus into every decision I make so that I can be a good steward of all God's given me. As someone who is an active abolitionist (fighting human trafficking and slave labour) I've realized more and more that my purchases and lifestyle do not just affect me, but they affect a whole chain of people. From the children who work long hours to pick cotton for my clothes, to the women who have to abandon their families all day to work long hours at sewing mills to assemble countless items of beautiful, (yet inexpensive) items to feed my greed. I have another task for you this year. Find the time and courage at some point to watch the documentary, The True Cost. I watched in on Netflix not too long ago and it is probably one of the most eye opening documentaries I've ever seen. I quote one young girl from the film, "What the people in America don't understand, is that they are wearing clothes that were made with our blood... Our tears and our blood..." The 2013 building collapse of a sewing factory in Bangladesh killing over 1 thousand people, leaving 2,500 injured is just one example of what happens when greed triumphs compassion and justice. Unfair working conditions, forced labour, slavery, these are things that in some shape and form I enable by making uninformed purchases. What is worse, who of us can say that we regularly make clothing purchases we NEED? For what purpose are we enslaving others? As Jen Hatmaker exposes from her own wardrobe in "7", (but this could be said of any of us) before starting to"simplify" her clothing, she found over 327 different items, and a decent percentage of those clothes she hardly wore. Some even had the tags on still. There are several ways to fight against slavery, one of course being to do your research and figure out if the items you are buying were made in the U.S. or if they are Fair Trade, but another great way to make a positive impact is just stop buying so much! Just because Forever21 has buy two get one free, or tank tops for $2.99 doesn't mean you need to get it. Just remember, the cheaper it is for you to buy, the cheaper it was to make, because the reality is, slave labour cuts costs. Do you know who has made YOUR clothing? For the sake of this blog I want to focus on this idea of buying LESS and refusing excess. When I moved this past November into a smaller apartment, God really broke my heart over this issue of excess. Why did I have boxes (plural) of shoes when my brothers and sisters in India or Ethiopia walk around bare foot? Why was I okay with the fact that I could hardly fit all of our possessions into our home when I've been to Brazil and other poor countries where the entire family eats off of one plate? Well obviously I am no longer okay with this. It's not enough for me to give $40.00 to Compassion International each month to sponsor a child. It's not enough for me to 'pray for the poor' when I stuff my face with 6 million different varieties of food. If you'd like to be challenged this year- if you really want to dive into Jesus words about 'loving your neighbor as yourself' or learning to live the simple way Jesus did, I highly encourage you to read this book. 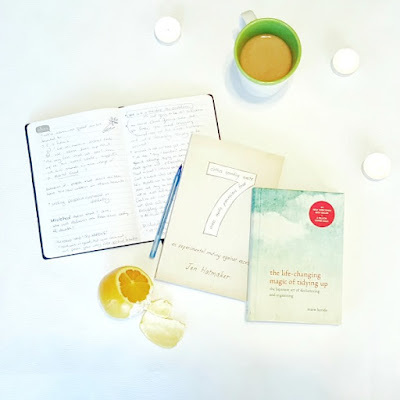 This past October / November when I was on tour in Alberta, my good friend Dana Marie started talking about the book, "The Life-changing Magic of Tidying Up". She exclaimed right away how this book has changed her life. She's been posting regularly about the life-giving, "keeping it simple" lifestyle changes. So how does this book fit into the topic of this blog you ask? It fits because it encourages a life style that is minimalistic, and a minimalist life is not only good for our spirit and our mind (too much mess, clutter and excess can be very stressful), but it's also good for the environment and the 29 million people that are enslaved in the 21st century. And lets not forget the over 300 verses on the poor. God obviously thinks very highly of the poor, and we cannot turn a blind eye towards them. How does my life style affect the weak or poor? How does my lifestyle enable or disable the Holy Spirit to work powerfully in my life and to advance His Kingdom on this earth? As someone who battles anxiety, I cannot tell you how liberated I've felt these past few months as I've cleaned house and simplified what I wear, what I own and what I eat. Clutter is my worst nightmare. Mess creates stress. Too many options in the fridge wastes time. This year I choose to simplify. Simplify everything. It is only after I learn to simplify will I actually have more time to do what is important and to do it well. I believe minimalism will become the new fad. I believe it is the way forward, because it is the Jesus way.